Not a member of the TimeBank yet? We ask that you consider mkaing a yearly donation to reflect the value you get from the TimeBank. Suggested donations are $20/year for an individual, $30/year for a household, and $150-$500/year for an organization or business. If you'd like your donation to be tax deductible you can make out a check to "Bridging Communities Inc" and put "UOC TimeBank" in the memo line. 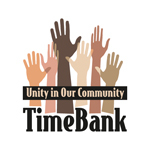 Send checks to Unity in Our Community TimeBank c/o Bridging Communities, 6900 McGraw, Detroit MI 48210.